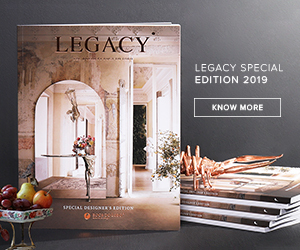 David Collins, an extremely talented interior designer with an architectural education, is recognised worldwide for his work with special focus on luxury restaurant and bar interiors, which can be found all over London and in many places abroad. 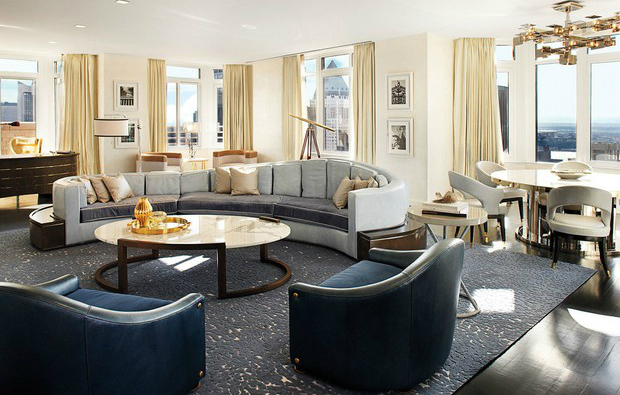 The London Penthouse, a David Collins masterpiece right in the center of Manhattan, can be seen as the pinnacle of luxury and sophistication. Collins paid meticulous attention to detail when he created this serene, sophisticated and sumptuous space. This 2,500-square-foot London Penthouse offers three walls of bay windows with uninterrupted, 180-degree views of Central Park, the Hudson River, the George Washington Bridge and the Manhattan skyline. Upstairs one finds just two bedrooms – a guest suite as well as a spacious master bedroom, accommodating a maximum of five guests. The master bedroom offers every luxury, from a king-size four poster bed to a private dressing room and sumptuous bathroom with spectacular city views. The guest room is smaller, but equally luxe. 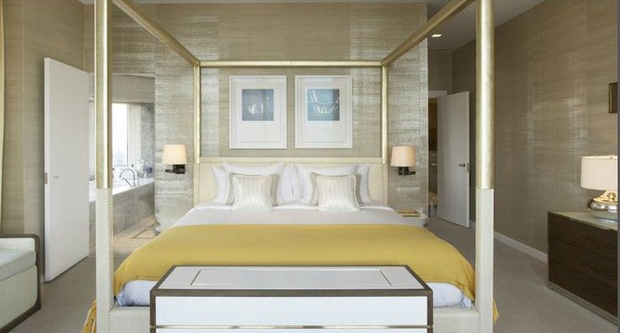 Furnishings are plush and bespoke, including Filli D’Oro Italian linen and hand-woven throws. The London NYC Hotel is ideally located on 54th Street, between Seventh Avenue and Avenue of the Americas. Its magnificent duplex penthouse is a lush oasis of privacy close to Central Park, Rockafeller Center, Times Square, Fifth Avenue and Broadway theaters.